Amazon Web Services (AWS) was launched by the e-commerce giant Amazon in 2006, and in just over ten years it has gone on to transform the IT industry in an era of widespread cloud computing. Currently, AWS offers various products that you can choose from in building your cloud computing. As for today, we are going to explain AWS Lambda – one of AWS product that offers a serverless compute service that runs your code in response to your command and automates it. Before we start, here are the some of the 5 key features that AWS Lambda has to offer. Imagine when you are building an application, you would like to provide a great experience to users. Maybe you would like to rapidly identify the user location, instantly resize uploaded file or generate in-app purchase options. In order to make sure all these to happen, your application needs backend code that runs in response to all these events. So, here comes the problem because managing the infrastructure to host and execute backend code requires you work on tons of thing. Such as sizing, proficient and scale a bunch of servers, manage operating system updates, applies security patches and then monitor all this infrastructure for performance and availability. Wouldn’t it be nice if you could just sit back, sipping your cup of coffee and just focus on building your great application without hassling on managing servers? With AWS Lambda, you can! But, what do you mean? AWS Lambda lets you run code without provisioning or managing servers. All you need to do is just upload your code or write it on AWS Lambda’s code editor, set up your code to trigger from other AWS services, then AWS Lambda will automatically run your code only when triggered. Plus, you only need to pay for the compute time you use. That’s all! There are no additional charges when your code is not running. With AWS Lambda, you can run code for virtually any type of application or backend service all with zero administration. 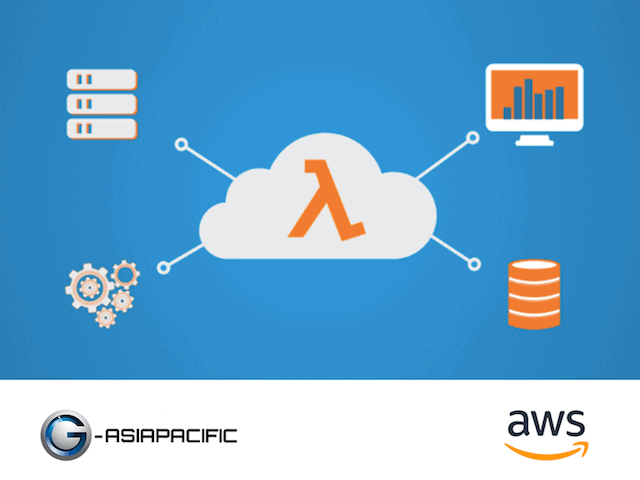 Want to know more about AWS Lambda and other AWS products features? Drop us an email at sales@g-asiapac.com or call us at 03-8084 2300. Follow us on our Facebook page for the latest cloud technology and media update. Visit our website for more information at www.g-asiapac.com. We are looking forward to meeting you all and help you with your cloud issues.